Using bleach to kill mould on non-porous surfaces is probably one of the most effect methods as it will eliminate almost all types of mould found in your home. Non-porous refers to any surface that does not have tiny holes in, which liquid or air can pass through e.g. plastic, glass, ceramic. To kill mould on porous surfaces (e.g. fabrics, wood, dry walls), you might be better served using something like hydrogen peroxide to kill mould or mould cleaning solution as bleach has a hard time penetrating below the surface of materials. Bleach will ultimately only kill the mould on the surface, and not the root, so it will most likely grow back if used as a solution for porous materials. Note, using bleach isn’t the most environmentally, natural or safest method of removing mould from your home, but it is one of the most effective. Open windows to help fumes/vapours to disperse from bleach solution. 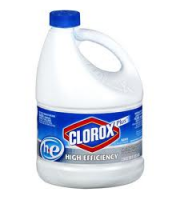 Mix one cup of bleach with a gallon of water (the ratio should be 1 part bleach, 10 parts water). Generously apply bleach to a cloth/scrubber and apply to non-porous infected area. Do not rinse off the bleach, allow to disinfect and naturally dry. Bleach releases fumes and is corrosive by nature, and it can burn skin and cause eye damage, so it is advised to wear the necessary protective clothing when handling bleach, especially concentrated forms. Always keep room well ventilated when using bleach. Read the instructions on the bottle for a complete safety guide. Do not mix bleach with any product that has ammonia because it produces a toxic gas when combined. Bleach is toxic to humans, it realises dangerous fumes, and is environmentally toxic when released into nature.